Immerse yourself in a 2 day, all Inclusive basketry workshop! Are you new to basket making or always wanted to take a workshop? Come cut your teeth on a challenging and rewarding beginning basket. Made baskets in the past? 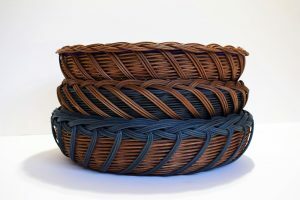 Come brush up on your skills and learn some new techniques and perspectives about basket making. Students will learn the twining technique, the fundamentals of materials selection, basket shaping, and the importance of tension while making an approximate 15″ diameter x 3″ tall basket. Baskets will be made from multiple diameters of round reed which lend textural interest. The split spoke and twined construction of this basket base will boast a colorful spiral pattern. There will be vibrant colors to choose form for the basket base as well as black and brown round reed for those with a more subdue pallet.